Yesterday was our "Aloha" themed overnight with Zoey and Gracie...since Aloha means both hello and good-bye I thought it might be a fun theme for saying good-bye to summer and hello to the new school year. I had scored a couple of old retired American Girl brand party sets (for 2) awhile ago on eBay and one just happened to be Hawaiian themed. Perfect! The kit wasn't complete but what it included was an invitation that you could glue sequins to (which we did). I wrote out the invitation to both Zoey and her doll and Gracie and her doll and gave it to the girls while they were playing. The invitation was to an evening "Aloha" dinner. I had found a Hawaiian looking backdrop at our local dollar store the week before (it was the last one in stock!) and I snatched it up not believing my luck! The dolls wore their dollar store plastic tablecloth hula skirts that I had made and the girls had some (not as fancy) ones cut from a plastic tablecloth as well. I hot glued some flowers to some hair clips for the girls as well. I was so excited about the back-drop! It was such a fun last minute addition! I had hung it outside so the lighting was good. I used electrical tape to hang it on the house so it wouldn't wreck the siding or the glass on our sliding door. 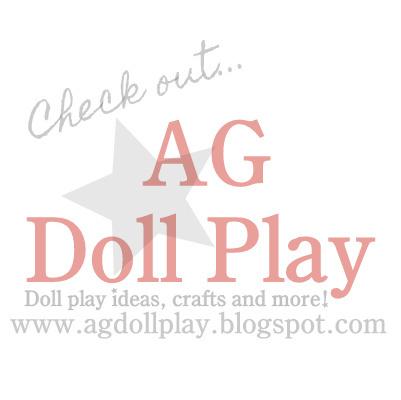 two kits to make doll-sized lei's and two kits to make girl sized lei's. Included were also two girl and doll matching paper plates, cups, straws with umbrella's, and silverware with ponytail holders for the napkins. Each girl also got a plastic dolphin necklace. Tomorrow if the weather is nice we will go swimming somewhere if the girls are up to it and perhaps the dolls will use their surf boards that we made last week! I wish AG would bring back those fun party sets!! They are so cute! thanks for sharing, looks like the girls and dolls had a fun time!! The pic of the dolls at the table looks great!